Most oil can’t just be pumped out of the ground and sold. It needs to be treated, to one extent or another, to separate the water, sediment, and other contaminants from the hydrocarbons. 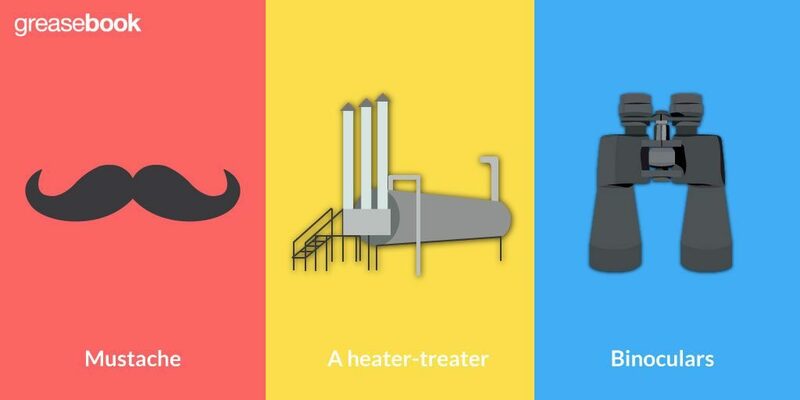 There’s a few basic methods of treating crude oil, some as simple as time, and others more complex. If separation happens in just a few moments or minutes, as when gas separates from fluid, it’s called flash separation. Separation that takes longer is called slow separation. Depending on how the well is producing, different treatment methods might be available. In higher producing wells, using more chemical may be necessary in order to speed up the separation process. Wells that only produce small amounts may have more time to treat the oil, and are able to let gravity and motion do more of the work. In most cases, the best option is going to be to use several different treating methods together. Chemical treatment is used on most operations, and is often the first step in separation. One type of chemical, called surfactant, can be added before the separator or even at the wellhead. Surfactant is oil soluble, and will reduce the surface tension of water and heavier elements of oil. This aids in water breaking out and falling away from oil. Figure 1. 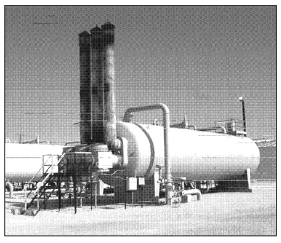 Here you can see a tank for holding chemical, and the pump and lines for adding chemicals at the wellhead. Chemicals can be added to crude oil for several reasons, not just as part of the separation process. Heat can be applied to oil as a way of reducing its viscosity, so that it floats to the top of the water. Heater-treaters are vessels that use heat from a firebox to aid in treating oil. The firebox may only be lit during colder months, and heat from the sun used in warmer months. Flow lines are often run above ground so that they can also be heated by the sun. Figure 2. 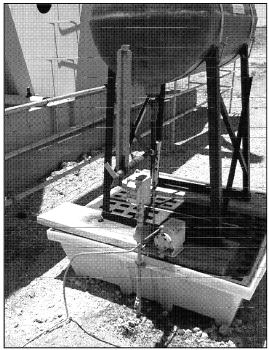 An example of a heater-treater. It’s often a goal to use as little heat as possible, as gas fuel for the firebox can be expensive. A growing trend is to eliminate artificial heat all together. Methods toward that goal are being developed, but it may be a few years before it’s truly possible to not use any heat at all. A variation of the standard vertical heater-treater is the electrical heater-treater. For high volume production, it may be the most efficient method of treating oil. However, it’s usually costly to run electrical lines to a lease, and the cost of using electricity for that purpose can also be expensive. Electrical heater-treaters are going to be economical for operations where the volume is high, or on offshore platforms where space is at a premium. The process of gravity separation is constantly underway. Even the heaviest elements of oil are lighter than water. As a result, oil will float on top of water. You can see this for yourself by pouring a glass half full of water, and then pouring vegetable or olive oil on top. The division between the two will be very apparent. The water, oil, and sediment that come from a well are all mixed together. However, because of their different weights and densities, they will gradually separate over time. Again, you can see that by mixing the oil and water in the glass together. Leave it long enough, and the oil and water will separate naturally once more. With the emulsion coming from the well, the different elements are obviously mixed much more thoroughly. Gravity will do a lot to remove the heavier parts, the free water and sediment, from the oil. Over time, however, gravity will become less effective. Bigger water droplets fall out of the oil more easily, but smaller droplets tend to be more stubborn. Gravity is always working to separate different parts of the oil, but it will usually need to be helped along by other techniques. Lighter elements will tend to separate from heavier elements under motion. It’s the least expensive way of separating, short of simple time. Oil can be circulated through stock tanks and other vessels, and the simple motion will break out some gas and water. As with gravity, movement works best in conjunction with other methods of separation. Using time along gravity will work to separate a lot of the sediment and water from oil, if the oil can be left to sit long enough. To maximize the amount of time oil is allowed to separate, treatment should begin as soon as the last load is sold. The amount of time you have should be used wisely, as it’s a limited resource which depends on the well’s production rate. Wells that have higher production rates will sell oil more quickly, and so the oil will have less time to sit and separate. Higher production means more money for other methods. However, wells that don’t produce as much will be able to let oil sit longer, and will have more time for gravity and motion to have an effect as well. Is your appetite for oil & gas operating knowledge insatiable like ours? 😀 If so, check out these related articles: Testing And Treating Oil & Gas Production, Chemical Treatment And Pumps In Oil & Gas Production and, Preparing and Selling Oil & Gas Production – they’ll be sure to pump you up!! !